Taking a family vacation can be an expensive undertaking. Whether you take a plane or train or drive yourself and stay in a hotel, campground, house rental or at a friend or family member’s home, costs can add up quickly. Add in meals, drinks and snacks as well as entertainment and extras, and treating the family can end up breaking the family budget. Many families have found RVing to be an economical way to travel with kids. According to a 2008 survey done by international travel and tourism research firm PKF Consulting, a typical family can save anywhere from 27 percent to 61 percent by taking an RV vacation compared to other types of vacations. Experts say now is a great time to invest in buying either a new or used RV, but if you’ve never tried it, you may want to rent first to see if the RV lifestyle is right for your family. More than 460 national chain outlets and local RV dealerships rent RVs, including state-of-the-art, late-model-year units. 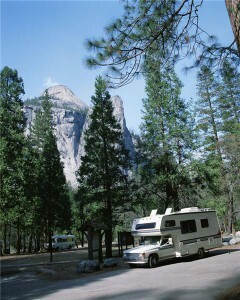 A growing number of campgrounds offer on-site RV rentals as well. Rental prices can range from $99 per night in the off season to as much as $370 per night during peak times, according to Family Fun magazine. Keep in mind that campsite prices can vary as well, but families will save on hotel costs and meals by staying in the RV and packing everyone’s favorite foods or making meals in the vehicle.